When heart muscle is activated, insufficient calcium is released into the cytosol to cover all the troponin C calcium binding sites. As a result, the force generation is less than maximal. Furthermore, the calcium concentration can be modulated by signal transduction systems such as occurs when the fi-adrenergic receptors are stimulated by norepinephrine. If the amount of calcium released into the cytosol is increased, the force generation for any given muscle length is increased, causing an upward shift of the systolic pressure volume curve, as shown in Fig. 6. 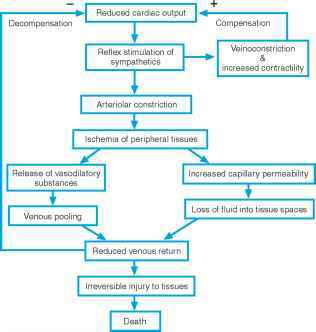 This is termed an increase in contractility. The effect of an increase in contractility on the ejection loop is to move point C to the left (toward a smaller end-systolic volume). If filling pressure, which is determined by the venous pressure, is unchanged, then end-diastolic volume will be unchanged. The reduced end-systolic volume will result in an increased stroke volume. Conversely, decreasing contractility tends to decrease stroke volume.